Happy Monday! I'm so excited to be able to finally share baby brothers nursery with all of you! Originally, I was extremely iffy on this space when we first started out. The room is pretty small compared to Camden's (see his nursery here), so we really had to mess with the layout a bunch of times to see what looked and worked best. I also kept changing my mind on certain things (like the paint color...about four times ha), too, so I was nervous that I just wouldn't love the end result because of how indecisive I was about everything! Well, that couldn't be farther from what I feel now because I'm in love with how it turned out! I love how the walls match the area rug and everything just flows really well together. One thing we did know was that we wanted to do a nautical theme because of my husbands love (and mine) for boating! It was really easy to find cute decor because it's pretty much everywhere in the stores right now. Also, since Billy's family has a boat and we go up to their cottage in the summer all the time, we plan to pick up some local pieces to add to his room too! Before taking these pictures, I had to triple check that all items with his name or initial were hidden in the closet because leave it to me to spill his name on this reveal post! I wouldn't be that surprised. I really really really love the gray crib and dresser. I'm so glad we went with it! Billy followed this tutorial to make the shelves and we decided that since we rarely use Camden's glider and ottoman anymore that we would just move it from his room into here. We actually bought Camden a big teepee to put in it's place so that he can read stories and play in, which worked out really well because he loves it and is really excited about it! If you're wondering where the changing table/area will be...well with Cam we hated changing him on top of the dresser from the side, so we've always just changed him on the floor on a mat, facing us straight on. It's totally personal preference, but that's why we didn't even bother getting one this time around! We just plan to change him on the changing pad on the floor or on a bed. Does anyone else do this? The oar side table is one of my favorite finds because it was on clearance for like $20 and it matches the room perfectly. If I forgot something and you want to know where it's from, just comment or email me! Love, love, love! You wanna come and do my next one?! You are too good! This is darling!!! What a great job you did. So cute!! Not that it needs any additional touches, hello nautical perfection! I can't help but tell you TJMaxx carries this ceramics line made by Rae Dunn and she just did a nautical line that would literally be perfect! If you get time, check out what I'm talking about on IG using #myraedunn. That's the easiest way I think for you to see them! Wow! 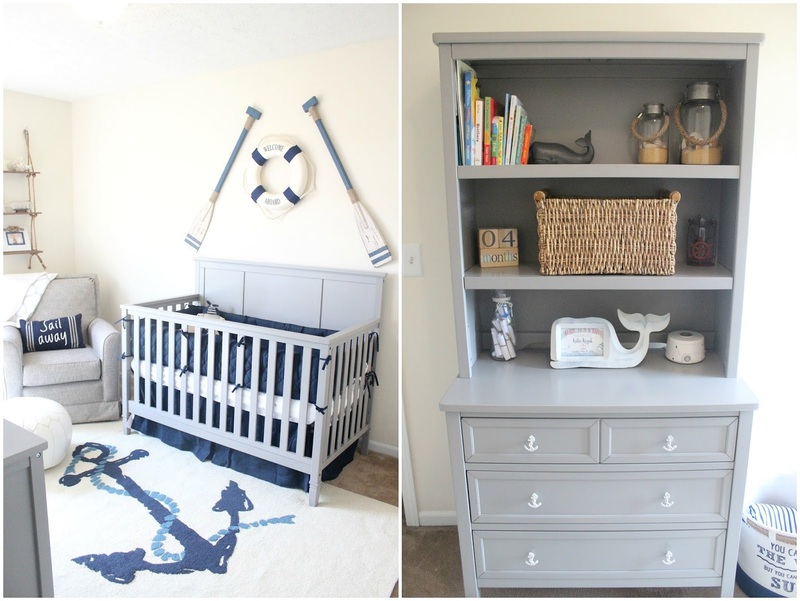 You did an awesome job on this nursery! I love the theme! This definitely puts ours to shame... I need to get decorating! So cute! We are doing a nautical nursery for our baby boy #2 too...yours puts ours to shame.. I have just started.. I have been on the hunt for oars so I will def be checking hobby lobby again. I did get alot of stuff from there too! Such a darling room! You hit the head on the nail with all of the details!! Love this! Where is the rope shelf from? I believe it is Silver Spoon by Olympic. It's a perfect gray! Love it! We have it in our kitchen too. It's beautiful! I can only change my daughter on her changing table still. If I try to change her on the floor or bed, as soon as she naked...she takes off! I have to hold her down to get her stay still to get a diaper on, lol.